1.One set includes 8Pcs Rose-gold Belly Button Rings, including 4pcs CZ long dangle rings and 4pcs different kinds of CZ rings. 2.Very reasonable price and deserve to buy.You are the special one when you wear Milacolato. 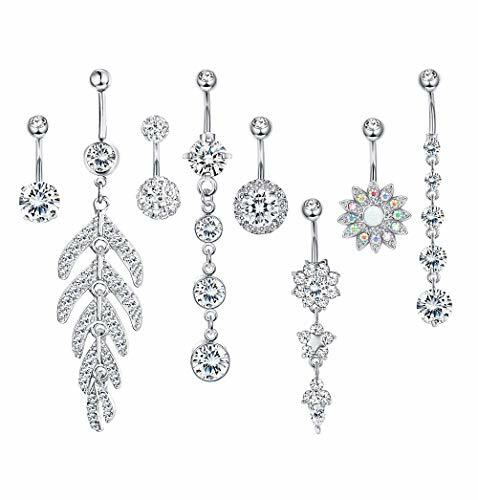 Affordable Set:One Order includes 8Pcs Silver-plated Belly Button Rings, including 4pcs CZ long dangle rings and 4pcs different kinds of CZ rings. Each has its Own Unique Styles,Meet All Your Needs. Safety Meterial:Made of surgical steel&Quality Acrylic, Highly Resistence to Rust, It Won't Hurt Your Skin, Comfortable and easy to Wear.Created Opal with CZ Inlaid, Stylish and Fashion Jewelry for Women and Girls. Gauge&Size: Gauge of Bar: 14 Gauge=1.6mm, Bar Length is 9mm, Top Ball Diameter 5mm, Common Belly Piercing Size.Regular piercing gauge for most of the belly.Comfortable to use.